This Country Heritage Park wedding was different in that the bride wanted to take portraits with her bunnies. The three photographs on this wedding album were captured during the beginning of the wedding day. The image in the upper left the wedding album shows the bride accompanied by her white bunny. The image right under shows the bride accompanied by her black bunny Pete. 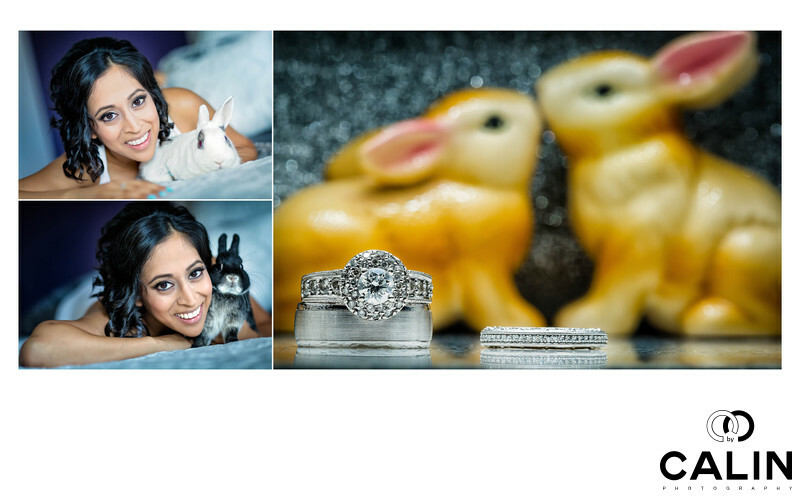 Finally, the image on the right showcases the wedding rings and, in the background, the two salt and pepper bunnies. I vividly remember taking these images during the special day when the guests and the parents were having a lot of fun. In fact, they were so loud, that the poor bunnies were clearly afraid of the noise. Once he completed the wedding day portraits of the bride and groom, we headed to the intimate wedding ceremony on the meadow at the Cassin Farm. To capture these pictures, I used an 85 mm lens for the bride's portrait and a 100 macro lens for the photograph of the rings. In terms of post processing, oft your colour correcting the image, I applied selective vignetting and increased the vibrancy of the colours. Interesting to note is that all the pictures employee the composition along the baroque diagonal. Also, in the brides portraits I employed the Dutch tilt, a technique whereby I tilt to the camera clockwise to obtain a more dynamic image.